Palo Alto’s, Nathan Martinez, dribbles around a defender during a recent game. 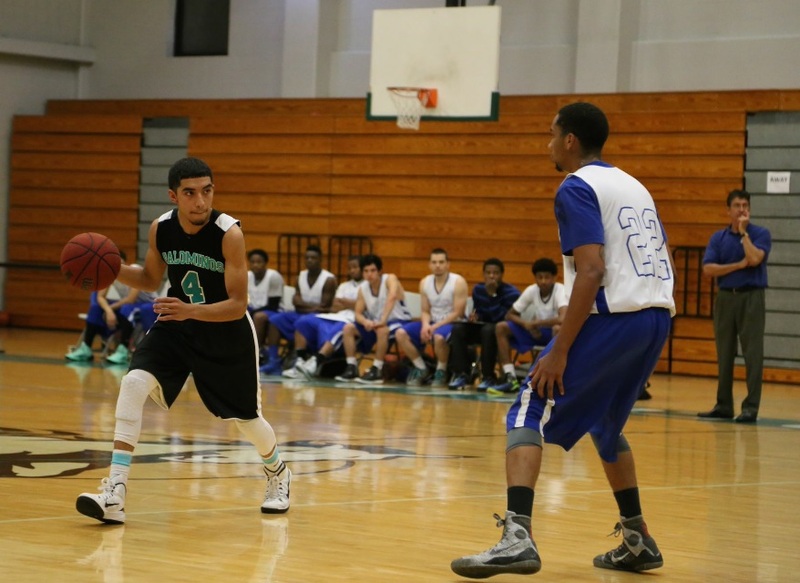 After a two-year hiatus, basketball is back at Palo Alto College. The Palominos are represented by both a men’s and women’s team as part of the Extramural League. The extramural teams are part of the Texas Collegiate Club Sports League, which include teams from several schools in the area. The West Division teams include Southwest Texas Junior College (Uvalde), The University of Incarnate Word, Northwest Vista College, San Antonio College and Our Lady of the Lake University. The East Division is represented by Victoria College, Northeast Lakeview College, St. Philip’s College, Palo Alto College and St. Edward’s University. To be considered for an extramural team, a student must be a full-time (9 credit hours) student, maintain a grade point average of 2.0, have Palo Alto as his/her main campus, and try out for the team. This current basketball season started October 15 and will conclude on March 4, 2015, followed by playoffs and a League Championship Tournament on March 28 and 29. The second half of the season starts in January, and another open call for tryouts for both basketball teams will take place in early January at the Fitness Center/Gym. Details on times will be posted at a later date. All games, home or away, are held on Wednesdays. Students receive free admission with a student I.D, and it is $3 for the general public. As a student athlete playing basketball for Palo Alto College, Nathan Martinez, a freshman Kinesiology major, hopes to transfer to St. Mary’s University and make the basketball team as a walk-on. “The experience I’m getting here, playing sports, is something different, and it gives me something to look forward to every day. I feel comfortable at Palo Alto, and it’s helping me get ready and adapt to college life before I transfer,” said Martinez. Team uniforms and travel expenses are paid by allocation money from the Student Activities Fee fund. For more information, you may contact Edward Moreno at emoreno131@alamo.edu or at (210) 486-3802.